Nilagang manok or boiled chicken soup is one of the simplest Filipino recipes by just boiling the chicken and putting all the vegetables and spices in a pot until cooked and presto! 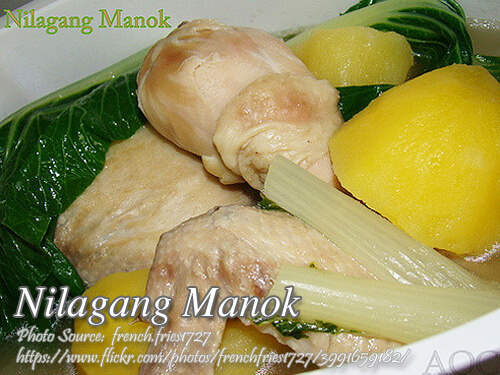 you have a tasty nilagang manok dish. In choosing the chicken used in this recipe, it is preferable to choose a native chicken instead of the commercial white leghorn or broilers. It is because the native chicken is a lot more tasty and flavorful. You just need more time in cooking native chicken because it is a bit tougher than the white leghorn or broiler. To tell you how simple it is to cook this dish, put the chicken pieces in a pot with water, peppercorns, salt, onion, and bring to a boil. Cover and cook until chicken is tender. Add potatoes, bananas, cabbage, pechay, green onions and green beans and cook for a few minutes until vegetables are cooked. Add season with salt and pepper to taste. Just like nilagang baboy I think this dish is easy to cook. Hi Ella, actually it is easier to cook than nilagang baboy and requires less time to tenderize the chicken meat.